PIN (CHATELAINE) - SARAH COVENTRY. "SWEETHEART" FROM 1956. CHARMING AND ROMANTIC: LIGHTWEIGHT GOLDTONE FRAMES WITH PUFFY PEARLIZED HEARTS AND CONNECTING CHAIN. 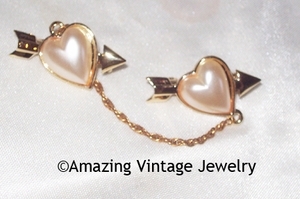 THIS STYLE OF PIN IS CALLED A CHATELAINE. EACH HEART IS 7/8" LONG, 1 1/8" ACROSS. VERY GOOD CONDITION . NOT MARKED, BUT SHOWN IN THE SARAH COVENTRY INSPIRATIONS PACKET.